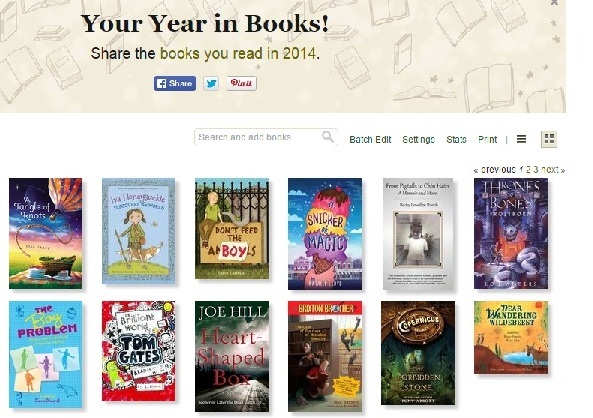 I opened the inbox today to find my Goodreads Year in Books! I love Goodreads so ridiculously much! At the start of the year, I sign on to the Reading Challenge and get motivated to pile up the reading points. (My goal this year was 60 and yep, I made it!) At the end of the year, the Goodreads team gives you all kinds of stats about the books you read. For example, I read 12,143 pages this year. Which sounds pretty impressive, even though I know about a dozen of my books were picture books. But a book is a book, no matter how small. And goodness, I read some wonderful big AND small books this year! Psst. What was the best book you read this year? I found my GR year in books in my inbox, too – so much fun! Congrats on achieving your goal! I’m closing in on mine – 85 books. Hmm, my favorite book of the year? I’d really have to think about that. For now, I’ll leave you with two recent favorites = FIVE DAYS LEFT by Timmer and LEAVING TIME by Picoult, and one I just finished and really enjoyed, THE SILENT SISTER by Chamberlain. I don’t think I can pick one! So I really liked The Fault In Our Stars, Beautiful Oblivion by Jamie McGuire, and then I also enjoyed Gone Girl. And I’m sure there are more from the beginning of the year that I can’t remember. I should be better about updating my stuff on Goodreads. 🙂 Happy holidays and reading. Thanks, Margo! I liked GONE GIRL and John Green is a master at great dialogue, though I liked his other books better than FIOS. I need to check out BEAUTIFUL OBLIVION! I just updated my books on Goodreads, and I’m sure I must be missing some. But of course, I can’t think of what I may have missed now. I’m currently reading The Book Thief. It’s December 27, and to reach my goal, I need to read another 7 books this week! I don’t think that’s going to happen! Happy reading to you!